Bookmytrainings is an online encyclopaedia to zero on skill development programmes of your choice and budget. 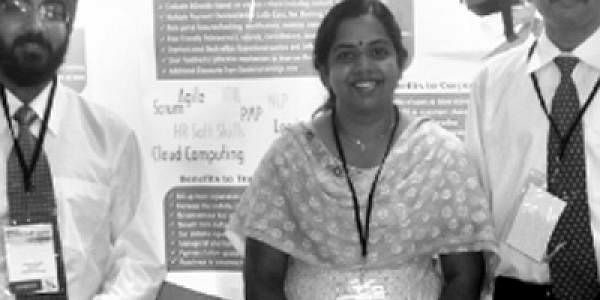 Co-founders of Bookmytrainings: Manjeet Singh, Aruna Balamurugan and LA Balamurugan. Try googling for ‘training programme’ and chances are that you would end up with inaccurate/duplicate/multiple info after a harrowing search of umpteen websites. Fret not when www.bookmytrainings.com is your ally. “We bring together training providers and seekers onto a common platform. With specific info on programmes like companies, their profile, fee, duration, USP, etc — your search is narrowed down,” beams LA Balamurugan, co-founder with over 15 years of experience in the IT field. And the best part — it’s absolutely free of cost to the seekers. In addition, you also get a discount if you book two or more training programmes on this seven-month-old portal. “It’s very frustrating for anyone to do an Internet search and in the end be at the receiving end of outdated information,” says Balamurugan, who is aided by his wife Aruna, an ICWA, and friend Manjeet Singh. The portal lists training opportunities in the field of Android development, cloud computing, entrepreneurship, HR soft skills, leadership skills, six sigma, etc. “Our portal is very user-friendly. Fill up a simple registration form and browse through the numerous opportunities listed by city or choice of field. We also facilitate the payment made to the training provider,” says the 39-year-old postgraduate from IIM-C. Even if one is not inclined towards taking up a particular training programme, you can nevertheless entertain yourself with the various blogs and articles posted on the portal. “These articles give you insights into the particular field by an expert in the same,” says Balamurugan. Naveen Pai working with ZipCash, Mumbai, who handles mobile payments has just booked a training programme via bookmytrainings. “Through a friend of mine, I got acquainted with this portal and I must say my wish of learning mind maps (a technique which helps to organise data in the mind) came true within minutes of registering,” he heaps praises. The training providers listed on the websites include KnowledgeWoods, Unicom, Benchmark 6ix Sigma, Limex, Anexas and Thought Capital. The duration of the programmes stretches for a few days to weekend batches, depending on the course and the training provider. The products also come up with special discounts and, of course, the deadline to apply besides the fee. “We also have a market research analyst who comes up with interesting trends, lists the best books to trust for learning a particular subject, etc,” says Balamurugan.